I learned something new today. I usually am fairly knowledgeable with geography but didn’t realize Corsica belongs to France. Another thing I learned this week….well not as much learned but acknowledged after years of denial. My handwriting is atrocious. I ordered myself this book to try to up my handwriting game, because honestly sometimes I have trouble deciphering my writing (which is pretty sad I know). I think both Roo and I are going to work through it because her handwriting isn’t that spectacular either. This week we are travelling to the South of France, and by we I don’t mean literally. Unless of course I win the 10,00,000 lottery draw tonight…..keep your fingers crossed for me 😉 Then I may just be on a permanent vacation starting next week. 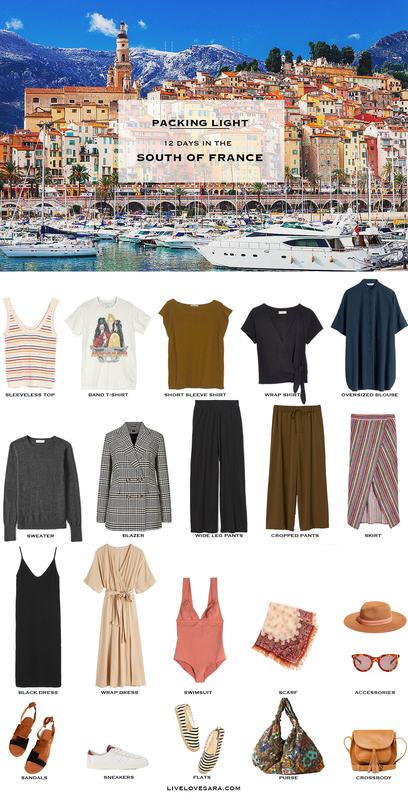 Until then though I have a What to pack for the South of France post to get me inspired. The South of France covers the southern part of France along the Mediterranean, so expect the typical Mediterranean weather. Since this trip taking place at the end of May and beginning of June, than the weather will be more temperate that the typical hot of midsummer. I went with a really neutral palette that makes me think of sunsets because that is what inspired me this week. I’m also really in to oversized blouses/button up shirts ever since I bought this one from Uniqlo. They are really versatile, and look great layered over pants or dresses, and if you are short enough and it is long enough then is makes a pretty awesome shirt dress. The above Uniqlo one works as a dress, and is quite oversized so you may want to size down a size or even two. This list is making excited for spring and summer weather. Are you feeling inspired for spring/summer yet? Even though it snowed on the weekend, and there are no signs of leaves, flowers, or green grass I am starting to feel the season shift and it is brightening my mood. *The bathing suit also comes in a lovely green.